From the gospel of John, Chapter 18, Pilot asks Jesus, “What is the truth?” Many in our day ask Pilate’s question, but from a different perspective. Noting that many things are true only on the basis of personal preference or perspective, they think all truth is personal, individual. The prevailing thought is that God belongs upstairs. An individual has a right to believe whatever they want to believe. Though this thinking is strong in our day, it denies the One who said: I have come to bear witness to the Truth. John 18:38. Kevin includes three important applications that we must follow as Christians. Kevin adds to his blog frequently and beautifully articulates many truths and applications for life, relationships, communication and many more. Craig had many examples of bearing witness to the Truth, we hope to share many over this blog! One particular instance happened at a University of Arkansas basketball game. This is a story Helen, Craig’s wife, has shared on her Instagram page, @HelenElizabethStrickland. “A maintenance man I’ve never met before came to help me fix some things at home this afternoon…when he saw the pictures of Craig on the wall he realized who I was and told me that he met Craig once at a basketball game and he impacted him greatly just in that one meeting. He had even posted about when they met while we were still searching for Craig. I thought this was such a sweet story. And it’s so cool to see how many people Craig touched in his lifetime. 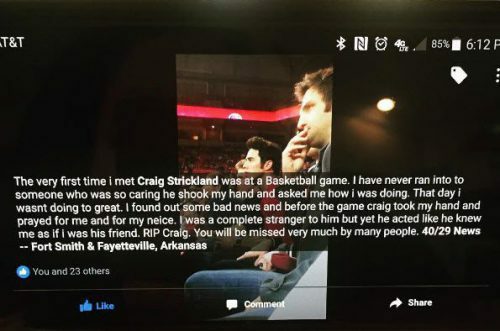 He was so special.” The picture below contains the story posted by the young man Craig met at the basketball game. We should all be more bold and bear witness to the Truth. Thank you Kevin Thompson, Helen Strickland and Craig’s friend at the basketball game for contributing to this blog.